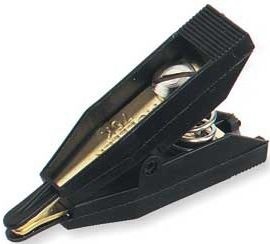 The Keysight 11062A Kelvin clip set consists of two gold-plated clip contacts for creating custom Kelvin probes for 4-wire resistance measurements. The wires are attached to the clips by slotted screws. One jaw provides the current path for the source, and the other provides the current path for the sense. The kit contains only the two clips. The Keysight 11062A is compatible with the Keysight 34460A, 34461A, 34401A, 3458A, 34420A, 34410A and 34411A digital multimeters as well as the Keysight 34970A and 34792A Data Acquisition/Switch Unit.